After almost 10 full years of a dedicated service to God and Christ’s Holy Church, after 10 years of a fruitful leadership as the head of our local Church and most prominent leader of our Serbian community in Australia and New Zealand, His Grace Bishop Irinej is about to leave us and take up a new appointment in His home country of America. This is not because He wanted to leave us and this not what He wished for. This is happening because He is a good and obedient child of our Mother Church, which has called Him to undertake a new duty as Bishop of the Eastern American Diocese and to undertake an almost impossible task of rebuilding St Sava’s Cathedral in New York, which sadly and tragically burned down on Easter day this year. The Church has chosen Bishop Irinej because of his diligence and dedication, because of His work ethics and leadership qualities, because of His visionary capability and general reliability, because of His soberness, reasonability, levelheadedness, balanced view and proper approach, but also because of His tireless effort and steadfastness. We have gathered here tonight to bid His Grace a farewell, to wish Him success and to say Thank You. Thank You Your Grace for you loving care for our Church and for every single one of us of your flock. We thank God for You and thank You for everything you have done for our Metropolitanate. Thank You for Your warm prayers and wise counsel; For Your exquisite sermons and magnificent speeches; For Your regular and tireless conducting of worship services and love for the beauty of God’s house; For the impeccable administration and fervent intercession before the Heavenly Throne of our Lord; For a proper and dignified representation of our Church and community among other Orthodox, Among other Christians and faithful of other religions; Thank You for being the best ambassador of our faithful Serbs living in this beautiful country; Thank you for your political representation, diplomatic activities and cultural engagements on our behalf before the political structures, diplomatic corps, cultural institutions and general public of Australia, New Zealand and other countries. We will miss Your presence and we will feel Your absence. We wish You success and a multitude of God’s abundant gifts we ask of God for You. 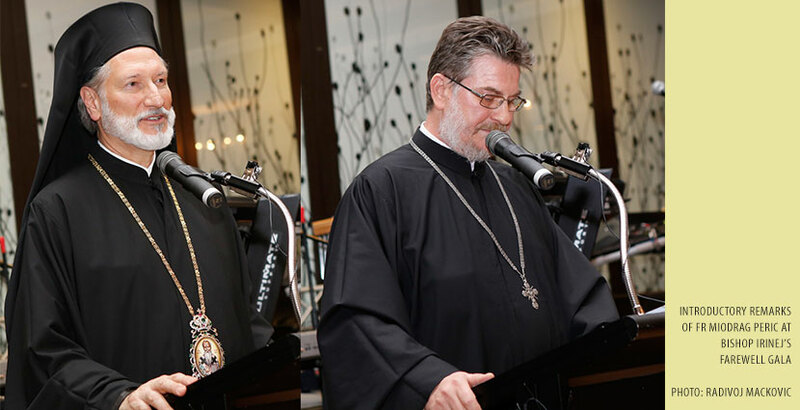 This entry was posted in Featured News, News and tagged Australia, Bishop Iakovos, His Grace Bishop Irinej, New Zealand, Sydney by Orthodoxy Cognate PAGE. Bookmark the permalink.